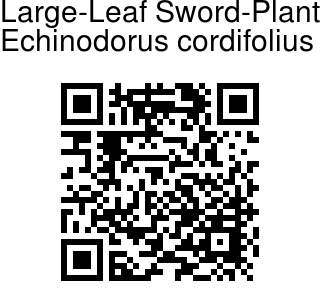 Large-Leaf Sword-Plant is a perennial, stout herb, up to 1 m tall, rhizomes present. Leaves are emersed, submersed leaves mostly absent, leaf-stalk 5--6-ridged, 17.5--45 cm, blade with translucent markings distinct lines, ovate to elliptic, 6.5--32 x 2.5--19.1 cm, base flat to heart-shaped. Flowers are borne in racemes, of 3--9 whorls, each 3--15-flowered, decumbent to arching, to 62 x 8--18 cm, often proliferating; flower-cluster-stalks round, 35-56 cm; axis triangular; bracts distinct, subulate, 10-21 mm, coarse, margins coarse. 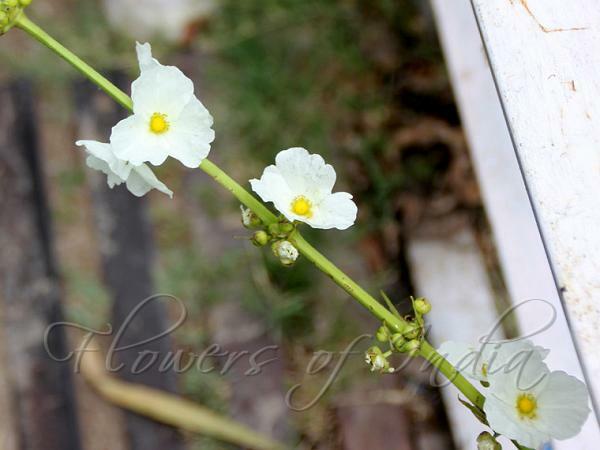 Flower-stalks are erect to ascending, 2.1--7.5 cm. Flowers are up to 2.5 cm across, sepals spreading, 10-12-veined, veins papillate; petals not clawed; stamens 22; anthers versatile; pistils 200-250. Fruits inverted-lanceshaped, plump, 3--4-ribbed, below 1-keeled, 2--3.5 x 0.9--1.5 mm; glands 3--4; beak at branch-ends,1--1.3 mm. It is native to Mexico, the West Indies, Central America, South America. Identification credit: Gurcharan Singh Photographed in Plantae Paradise, Datyar village near Parwanu, HP.